The Global Volcanism Program has no activity reports for Titila. The Global Volcanism Program has no Weekly Reports available for Titila. The Global Volcanism Program has no Bulletin Reports available for Titila. Titila is the youngest known small Icelandic-type shield volcano in the Sredinny Range. The basaltic shield overlooks the NW shore of Lake Glubokoye, west of the crest of the central Sredinny Range. Lava flows radiate from two summit craters, and cinder cones are prominent on its southern flank. Titila overlaps with another small shield volcano, Rassoshina, located immediately to the west. A young lava flow traveled to the north from a vent on the NE flank of Rassoshina. The latest known eruption took place about 2,500 years ago. Dirksen O V, Bazanova L I, Pletchov P Y, Portnyagin M V, Bychkov K A, 2004. Volcanic activity at Sedankinsky Dol lava field, Sredinny Ridge during the Holocene (Kamchatka, Russia). IV Internatl Biennial Workshop on Subduction Processes, Petropavlovsk-Kamchatsky, August 21-27, 2004, Abs. There is no Deformation History data available for Titila. There is no Emissions History data available for Titila. The light-colored, smooth-textured volcano near the right-center margin of this NASA Space Shuttle Mission image is Titila. 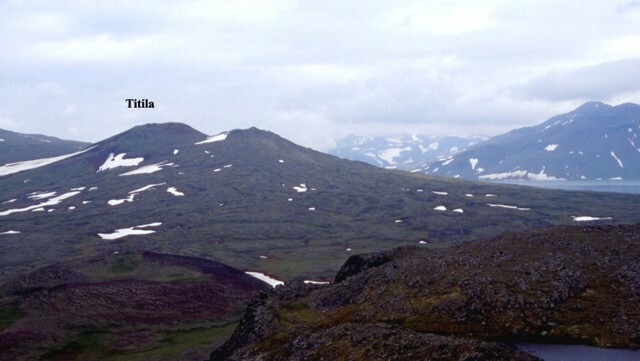 This small late-Quaternary Icelandic-type basaltic to basaltic-andesite shield volcano lies east of the eroded Pleistocene Shlen volcano (far left). 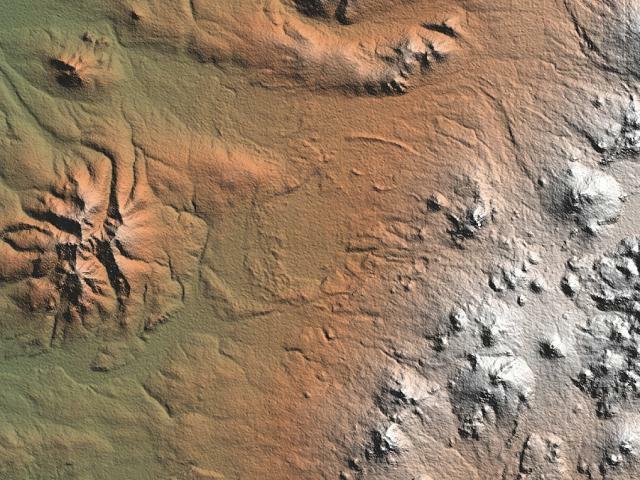 Lava flows radiate from two E-W-trending summit craters of Titila, and cinder cones are prominent on its southern flank. 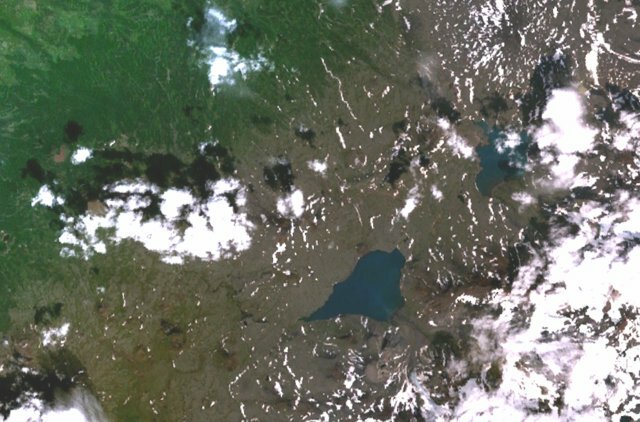 The volcano near the center of this NASA Landsat image (with north to the top) overlooking the NW shore of Lake Glubokoye ("Deep Lake") is Titila. This small late-Quaternary Icelandic-type basaltic to basaltic-andesite shield volcano lies west of the crest of the central Sredinny Range. Lava flows radiate from two E-W-trending summit craters of Titila, and cinder cones were constructed on its southern flank. Titila shield volcano is viewed from the south. Titila started to form in the late Pleistocene. The volcano was active about 10,000-8000 and 3000-2500 years ago. A flank vent (forming the summit to the right of Titila) was formed in the early Holocene. Its lava flows dammed a river to form Glubokoe ("Deep") Lake (at the far right). Copyrighted photo by Maxim Portnyagin (Holocene Kamchataka volcanoes; http://www.kscnet.ru/ivs/volcanoes/holocene/main/main.htm). There are no samples for Titila in the Smithsonian's NMNH Department of Mineral Sciences Rock and Ore collection. Large Eruptions of Titila Information about large Quaternary eruptions (VEI >= 4) is cataloged in the Large Magnitude Explosive Volcanic Eruptions (LaMEVE) database of the Volcano Global Risk Identification and Analysis Project (VOGRIPA).